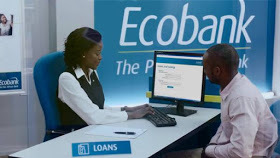 Ecobank joined suit in making transaction easier for all their customers. They are improving in all ramifications of service, just to see that their customers bask in euphoria of joy. As Ecobank user, you can now make transactions with your mobile phone from the comfort of wherever you are. So, if you are banking with Ecobank, read on and see one of the transactions which you can make with your mobile device. The service is all about you recharging or buying airtime directly from your Ecobank account whether you are using savings or current account. And this time, you don't need to goto ATM before you can buy airtime from your account. Now, it is made easy and simple as you can recharge your line by dialing a USSD code only on your mobile phones. Below is how to do that in a twinkle of an eye. √ SEE ALSO: Buy Airtime/Credit From Your UBA Account Through Mobile Phone. To buy credit on any of the network line associated to you Ecobank account, simply dial this code *326*Amount#. For example: if you want to recharge #500 naira, dial it in this format *326*500# on your phone. Once, you are through with the dialing, you will receive a notification about the debit on your account. Note: For you to recharge any phone number, it means that, the phone number is such that is already activated and active with your ecobank account, if not of that, trust me you will get a failure result after dialing. So be sure, the number you are are dialing it on, is the one you registered during your ecobank account registration. Share to friends on social medias using below buttons. Thanks.